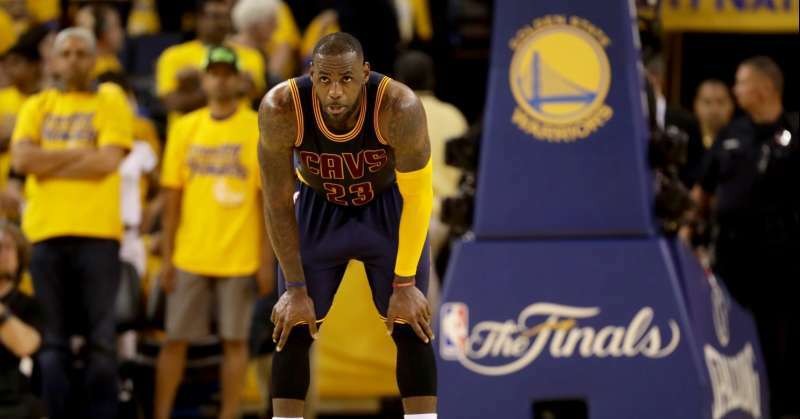 LeBron James deserves 100% of the blame for the Cleveland Cavaliers’ piss poor performances in the first two games of the 2016 NBA Finals. We’re talking about one of the greatest basketball players of all-time. In the past six years of his career (since The Decision), Bron Bron has had the privilege of picking which all-stars he wants to play alongside. So before you point to his “lack of a supporting cast” as the reason why the Cavs have been outscored by 48 points so far in the series, just remember that this is exactly the team that LeBron wanted and the one that he helped assemble. It was LeBron who persuaded the Cavs to trade Andrew Wiggins for Kevin Love in the summer of 2014. A bad idea in hindsight, but one could understand the reasoning at the time. Wiggins was an unproven rookie and Love was arguably the best power forward in the NBA, averaging 22.6 points and 13.7 rebounds per game over the previous four seasons. Everything was set up perfectly. LeBron was going to join Love and Kyrie Irving, two of the biggest young stars in the NBA, to form the latest version of The Big Three. All of the pieces were in place for him to bring Cleveland that championship that he had promised them to make up for stabbing them in the back in 2010. In LeBron’s first stint in Cleveland, lack of a supporting cast was a legitimate excuse. The 2006-07 Cavaliers might have been the worst team to ever make the NBA Finals. If you’re still making that excuse for the “King” in 2016, it’s time to take a step back and accept the fact that LeBron James just might not be the player you thought he was. He was supposed to be the next Jordan. He’s proven time and time again that he doesn’t have the balls that Jordan had, nor the ability to make players around him better. Love, who probably has more ability than anyone MJ ever played with, has gotten significantly worse since joining forces with LeBron. I’m not saying it’s LeBron’s fault that Kevin Love is soft and doesn’t appear to have much drive, but James certainly hasn’t done much to help the situation. I said this last year and I’ll say it again. In order to be in the conversation for greatest of all-time, LeBron first has to reach the greatness of guys like Larry Bird, Kobe Bryant, Magic Johnson, and Bill Russell. He isn’t there yet and at this point he may never get there, so let’s not rush things. If the Cavs lose a hard-fought series to the greatest regular season team ever, it wouldn’t surprise anyone. However, if they continue to get rocked like they did in games one and two, LeBron’s legacy will (and should) take a huge hit.